Our Spa Salts are proudly born from the Dead Sea, where Mother Nature’s capable hands lovingly sculpt them to perfection. And, since we dare not fuss with Mother Nature's work, the only thing we do is bless each salt crystal with our wild harvested botanicals, organic flower petals, therapeutic grade essential oils, organic oils, and vitamins. The divine result is a zen centered bath soak that draws upon the sacred union between the living waters of the Earth and their innate abilities to rebalance the body temple, while drawing weariness from tired and overworked muscles. 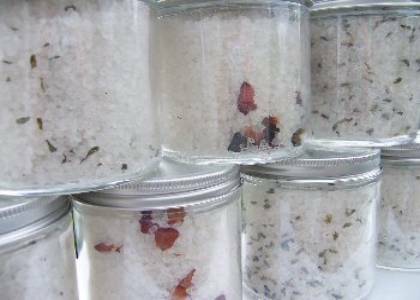 Thus, it is our privilege to bring you these soothing natural Bath Salts. May each Spa Salt bring you a calm spirit and relief that comes from being one with the Earth and healthy in all aspects of your being. Here, Dead Sea Salts are tossed with Bolivian Rose Salts and organic Rose Buds. Essential Oils of Rose Otto and Rose Geranium pair beautifully with the organic bits of organic Cocoa Butter and a splash of Aloe to render a soothing feminine Spa Salt. This is an unapologetically chic Rose Bath Salt that is nothing short of stupendous! Served in a one pound (16 oz.) recyclable jar! A gratis 8 oz. Spa Butter is included. Here, our Lavender Spa Salts are sprinkled with tender buds of Lavender, while Essential Oils of Lavender, crushed Calendula and Aloe is paired with organic Cocoa Butter to give our Lavender Bath Salts a more exotic slant. This is an unparalleled Lavender Spa Salt that showcases Mother Nature’s affinity for making magic from all things natural. Served in a one pound (16 oz.) recyclable jar! A gratis 8 oz. Spa Butter is included. Here, our Jasmine Spa Salt blend is tossed with tender buds of Jasmine and pure Jasmine Essential Oil. A generous sprinkling of vitamins elevates its nutritional value, while fresh Vanilla Bean adds a striking scent that proves worthy of your home spa ritual. Served in a one pound (16 oz.) recyclable jar! A gratis 8 oz. Spa Butter is included. Here, our Ginger Spa Salt blend is tossed with dried Ginger, organic Ginger Powder and Ginger Essential Oil. This triple helping of Ginger adds a more assertive aroma that lends itself well to enhance your mood and calm your spirit. Ginger is also a magical antiseptic and decongestant for weary skin and muscles. The unexpected addition of sweet Lemongrass and Cardamom is astonishingly aromatic and adds a lemony note that balances the herbaceous scent of Ginger ever beautifully. Served in a one pound (16 oz.) recyclable jar! A gratis 8 oz. Spa Butter is included.